I usually don’t write a blog two nights in a row, but I’m on a writing high these days, and so many ideas are running through my head and dancing in my hair. I am a fantasy writer, but it’s fantasy with a modern twist. Usually my heroine is female, and she finds herself in improbable and impossible situations. It’s my way of dealing with the bizarre. You can do it, too. All you have to do is start with….What If? I know I wrote a blog about “what if”, but this is an exercise in getting a story written. Here are some ideas. What if you were driving home from work one afternoon and in the distance, over the tops of the trees, you see a giant ant ripping off tops of houses? What if you went to bed one night with your special someone and the next morning they had a totally different face? What if you walked through a cornfield and came out in another world? What if you went for a walk in the evening and you actually met an elf or a dwarf? What if you were driving and you lost control of your car and crashed, waking up in the 1800s? What if you were relaxing one night, watching TV, and you say something to your dog, and he answers you in English? What if someone crystallized into your living room one morning and asked you to come along with her/him on an adventure? I know it all sounds goofy, but think about it. Close your eyes and just think if any of the above happened to you. Or to your friend. Or to your cousin. What would they do? For real? My favorite form of writing is to put a modern day person in an absolutely wacky situation. Their situations are REAL. There really is a giant ant walking behind the trees. The person really walks through a cornrfield and finds a different world at the other end. That is how you get inspirations for stories. A few of the above are my story ideas. And I’ve had a ball with all of them. 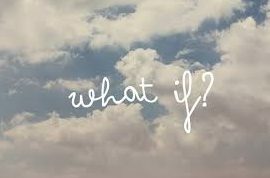 Your “What If?” can be anything you want. It doesn’t have to be out-of-this-world — it could be What If you witnessed a murder? A kidnapping? Someone stealing from the books? Let your mind wander into various What If Worlds until you find one that appeals to you. Then keep it real within the parameters of the main character.How they deal with the strange and unusual is up to you. Let the unusual be as real as you can make it. Then go for it. You can’t lose. I’m waiting for a blue telephone box to land in the backyard and I’m climbing in! Nice post. And if it did, where would your first stop be? I’d love to read about THAT! I love the cornfields. That would be so cool. Thanks for giving me something to think about.